Virbac Animal Health offers a long acting solution for worm control in sheep to prevent infestations from impacting the fast-growing lamb industry. Best practice worm control measures need to be applied by the industry to ensure the continued growth as well as maximise the opportunities presented by the strong market, according to Virbac Australia’s David Anderson. Recent wet weather conditions mean worm and disease control must become a key priority for Australian meat sheep producers. Worm infestation in sheep can cause heavy production losses with a potential financial impact of over $100 million across Australia. David warns that meat sheep producers must re-evaluate their worm control strategies as cool and wet weather conditions create the ideal environment for worms and larvae to thrive. David recommends Cydectin Long Acting Injection for Sheep (LA), a long acting solution that is easily administered under the skin at the base of the ear or upper neck. Ideal for use pre-lambing to help ensure pastures are cleaner and exposure to internal parasites is reduced, Cydectin LA controls worms and minimises worm egg counts. An excellent alternative to capsules pre-lambing because of its high potency, Cydectin LA provides more than 91 days of persistent activity against barber’s pole worm and small brown stomach worm and up to 49 days of persistent activity against black scour worm. 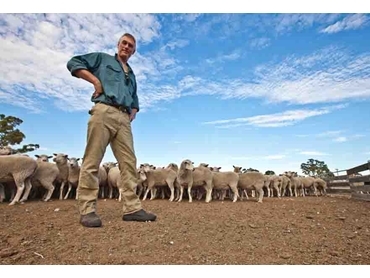 John Mossop, a meat sheep producer from Penolain, South Australia who has recently started using Cydectin LA pre-lambing has run a worm management program for his 5000 ewes, which includes a summer drench and drenching of lambs at weaning followed by additional worm control as required, based on faecal egg counts. John introduced Virbac’s Cydectin LA injection pre-lambing for all ewes last year because of the wet summer that brought about fears of worm infestations. John found that drenching with Cydectin LA was also much quicker and easier, with the subcutaneous injections completed in half the time of other worm control programs. John now plans to continue injecting his ewes pre-lambing as part of his ongoing management practice, and is looking forward to a bright future for the industry.